A superb example of a three bedroom semi detached bungalow, in our opinion decorated to a high standard throughout. 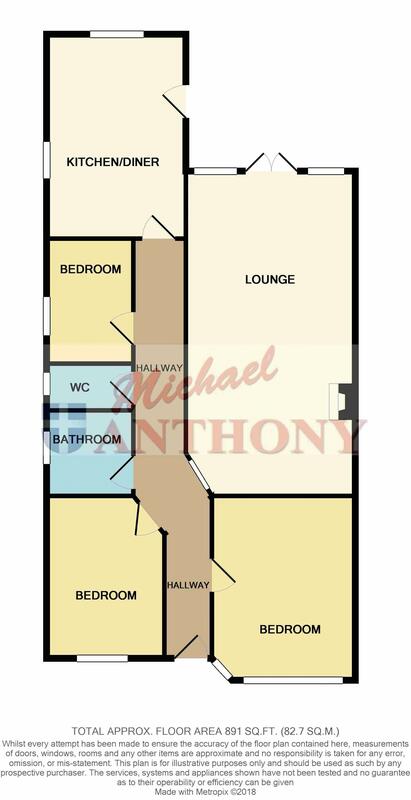 Situated close to local shops and restaurant and conveniently close to train station and schools. Offering entrance hall, downstairs cloakroom, lounge with a wood burner, kitchen/diner, bathroom, garage & off road parking for three cars, front & rear gardens. A MUST VIEW. UPVC door to entrance hall. Tiled floor, two radiators, access to loft space, storage cupboard, doors to bedrooms, bathroom, cloakroom, lounge and kitchen/diner. Frosted double glazed window to side aspect. Radiator, tiled floor, part tiled walls, low level w.c. pedestal wash hand basin. Double glazed door to garden, internal double glazed window to hall. Two radiators, log burner. Double glazed windows to side and rear aspects, double glazed door to garden. Fitted with a range of base and eye level units with square edge work surface and upstand, one and a half bowl stainless steel sink unit with mixer tap, integrated under counter fridge and freezer, space for washing machine, wall mounted boiler, space for cooker with extractor over, tiled floor, two radiators. Half bay double glazed window to front aspect. Fitted wardrobes, radiator. Frosted double glazed window to side aspect. Tiled floor, part tiled walls, low level w.c. vanity wash hand basin, radiator, panelled bath with electric shower over. Up and over door, off road parking for three cars. Mainly block paved, flower border, bush and tree. Mainly laid to lawn with patio area, raised flower bed, retaining wall and step up to top garden, mainly laid to lawn with flower borders and greenhouse.